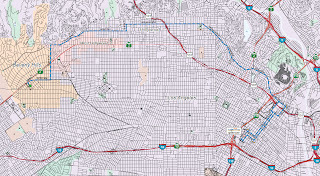 FINISH: Los Angeles (L.A. LIVE), 11th and Figueroa at 11:42-11:58am. 1 SPRINT: as they begin lap #1 of 5 laps near the finish at 10:53-11:01am. 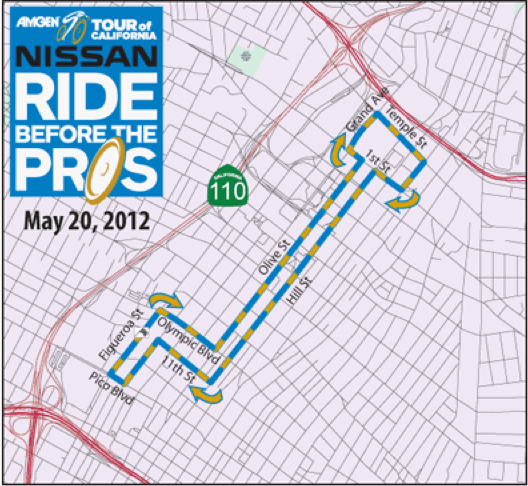 Road Closures: The citizen's event ride begins on the circuit loop at 8:00am, this section will likely be completely closed in the morning. Police and crossing guards will allow traffic to cross (but not drive on) the route from Beverly Hills to L.A. LIVE at certain points during early morning hours. 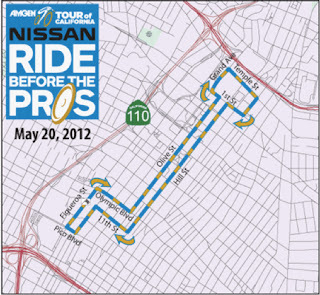 The real race begins at 10:10am, the route will be completely closed perhaps 15-30 minutes before the race. During the race, pedestrians on foot will be allowed to cross the course at designated crossing points monitored by police or volunteers, you may have to walk 4-8 blocks between crossings.